Sometimes the physical changes made in a school building open up possibilities for significant changes in the way learning takes place. 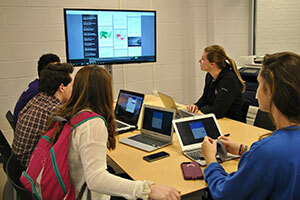 After months of construction behind closed doors, Warwick Valley High School students and teachers were very curious about what the newly renovated Media Center and Communications Suite would look like. 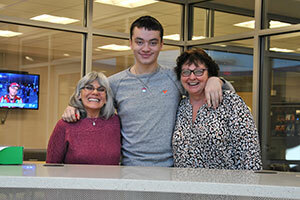 And judging by the number of students and teachers who now fill the space each day, the new design is a great success! The old, traditional library and adjoining communications classrooms were re-imagined by District administrators as a state of the art media center. 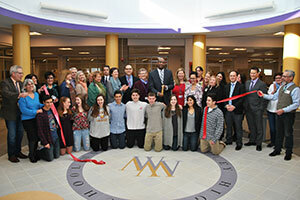 Since the official opening of the newly renovated, multi-purpose space in mid-February, the Media Center, with its upgraded facilities and features and comfortable furniture, has become a central gathering space in the school. 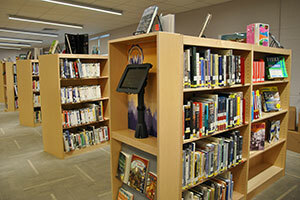 The Media Center portion of the renovation project involved transforming the high school’s traditional library into a modern media center, with new technology and flexible spaces for individual and collaborative work, while retaining an extensive book collection. Several multi-purpose learning areas, with moveable walls and furniture, can easily be reconfigured for different group sizes and uses. Beyond the sun-filled rotunda is a quiet study area that houses the book collection of over 10,000 volumes, along with large moveable tables and chairs, in a sound-resistant area with glass walls. Dedicated, mounted tablet computers – a modern version of the traditional card catalog – allow users to easily browse the collection. On one side of the Center are two classroom areas, each with sound-resistant removable walls that can be moved to accommodate larger groups. Each space holds a television and several cables that connect to laptops used by group members, so students and teachers can view each other’s screens for collaborative work. 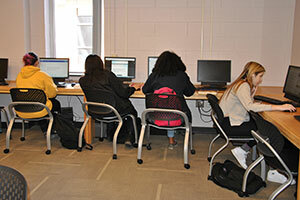 The renovated computer lab in the main area of the Media Center contains 25 new computers, in addition to those in the existing computer lab across the hall. This area has been re-designed to better facilitate collaboration and large group instruction. In the presentation area, flexibility is the underlying concept. Depending on the use and audience size, tables on wheels can be moved into a circle or a regular classroom setup, and a movable wall can be adjusted or turned around to use the interactive whiteboard on the other side. Teachers bring their classes to the Media Center, and students can come during unit lunch or study hall to work individually or with others. 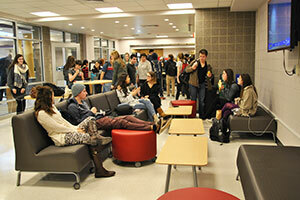 And students enjoy the entry cafe area, where they can grab a snack from one of the vending machines that offer healthy food, socialize and watch the news on a mounted television. 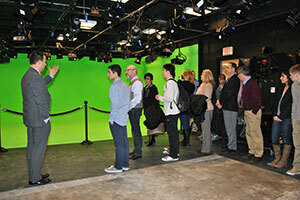 The goal of the redesign of the adjoining Communications Suite for Communications classes was to support a hands-on program to prepare students with practical knowledge, advanced technical skills, and professional level experience in the field of video/audio/television. The renovation of this area includes new, college level facilities including classroom space; a television studio with large “green screen” to allow insertion of any background after filming; new lighting, sound and video equipment; new computer lab with professional editing software; new control room and digital storage area; and flexible viewing area. Students will have the opportunity to learn filming, editing and production skills to create talk shows, newscasts, visual media and more in classes taught by Communications teachers, Mr. Pat Dool and Mr. Kirk Thomas. 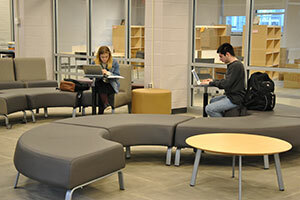 Designed to have the feeling of a college student union, the new area has quickly become a popular and central learning space in the high school. 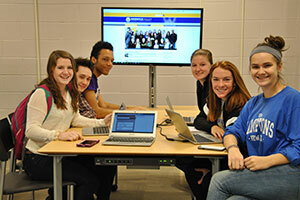 The Media Center and Communications Suite technology upgrades were funded by the 2014 New York State Smart Schools Bond Act, created to allow school districts to upgrade their technology, connectivity and security. The physical renovation was a District capital project. The district plans to fully utilize the significant upgrades made in the high school’s Communications facilities and equipment, and plans are in the works to offer a Career & Technical Education (CTE) path in Video Communications/Digital Filmmaking & Post Production through Orange-Ulster BOCES. “With the foundation of a strong high school media program,” says Mr. Thomas, “our students will be motivated to pursue college credit and professional certifications in wide-ranging careers related to digital content creation and video media production. Students and teachers are eager to use the new, upgraded spaces and technology, which allow more opportunities to learn advanced skills in a collaborative setting.